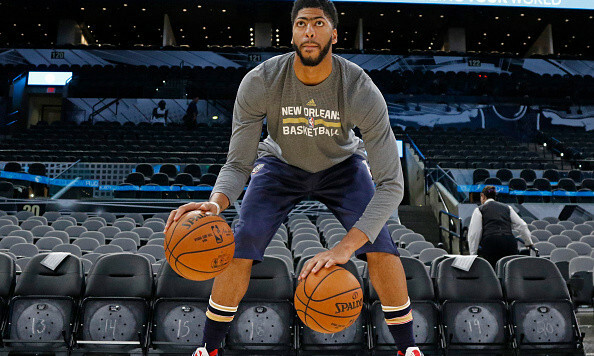 New Orleans Pelicans superstar forward Anthony Davis is looking to accomplish a feat that hasn’t been done since the 1999-00 season by Hall of Famer Shaquille O’Neal. The feat that he is trying to carry out is winning both the MVP and scoring title as a big man. As I mentioned, O’Neal was the last big man to win both awards in the 1999-00 season as he averaged 29.7 points, 13.6 rebounds and 3.0 blocks per game. He also shot 57.4 percent from the field, including 57.5 percent on two-point field goals. If those numbers are the gold standard for Davis to win both awards, then he is already off to a ridiculous start to begin the 2016 season. Through six games, Davis is averaging 30.0 points, 11.8 rebounds and 3.2 blocks in 38.0 minutes per game. He is also shooting 47.2 percent from the field, with most of his shots coming in at the rim, where he is making 56.2 percent of them. Davis is also second in the NBA in two-point field goal attempts with 113, behind Toronto’s DeMar DeRozan (119). Davis began his excellent play on Opening night as the Pelicans were taking on the Denver Nuggets. Despite the Pelicans losing 107-102, which has been a common theme for them in the early part of the season, Davis played excellently finishing with a double-double consisting of 51 points and 16 rebounds in only 41 minutes played. Not to mention, he also went to the free-throw line 17 times and converted them at a 94.1 percent clip. Outside of the statistics from that game, Davis looked healthy as he is coming back from a shoulder injury that cut short his season last year. He was able to do what wanted on the floor and the Nuggets had no answer for “The Brow”, who also showed that he can bring the ball up the floor. If his 50-point performance didn’t make you say he could be a contender for the MVP, he followed up that performance two nights later against the Golden State Warriors. Once again, the Pelicans lost 122-114, but Davis put on a show, as he had a double-double consisting of 45 points and 17 rebounds. Just like in the Pelicans’ first game, Davis went to the line 14 times against Golden State and converted his free throws at a 71.4 percent rate. After having two outstanding games back to back, Davis came back to down to earth against the Sacramento Kings but earlier this week against the Milwaukee Bucks, he erupted for 35 points and 15 rebounds. Again, the Pelicans lost, but Davis dominated and single-handedly kept them in the game. An underrated factor of Davis’ game, which most won’t focus on is how he can put the ball on the floor like a guard and get to the basket at will. This season, Davis has already gone to the line an unprecedented 74 times, which is only second behind Sacramento Kings’ center DeMarcus Cousins (76). When O’Neal won the MVP and scoring title in 1999-00, he went to the line 824 times. Now, it would be far-fetched to think Davis will get to the line that many times as his highest amount of free throw attempts in a season is 461 (2014-15). But we also have to remember they are two different types of big men as O’Neal is more brute force and strength, while Davis is more athletic and finesse. Nevertheless, it should be fun to see how Davis’ season plays out. On Friday night, him and the Pelicans suffered another loss, this time at the hands of the Phoenix Suns 112-111 in the overtime. Despite the loss, Davis still put up a double-double consisting of 22 points and 11 rebounds. With him being the only focal point on offense, he should be in contention for both awards this season, but he does have some competition with Russell Westbrook and DeRozan putting up ridiculous numbers themselves. This season, will be the year that “The Brow” re-establishes himself as the best big man in the NBA.